As a society, whether we like to admit it or not, a new drug has arrived on American shores. This new substance, known in Russia as Krokodil, has the potential to be the most damaging drug for the United States since the methamphetamine epidemic. Turning its users skin scaly and rendering them powerless to the craving of the drug, Krokodil truly is a zombie drug. Krokodil has actually been around for some time, both in legitimate prescription use as desomorphine and illicit use as krokodil. Originally patented in Switzerland under the trade name Permonid in 1932, its use was swiftly discontinued because it was not only found to be more potent than morphine, but more addictive as well. It was for this very good reason that it faded into obscurity for some time. Fast forward to Russia in 2003, it was at this time that the reports of clandestine cooks making desomorphine began to surface. 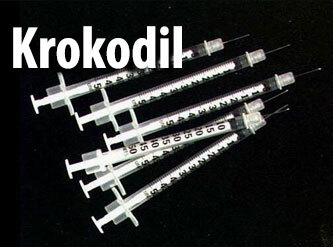 It did not take long for it to gain popularity among users or gain the nickname of Krokodil. Roughly 100,000 people abuse this flesh eating drug in Russia as of 2010, which is when it started gaining major media attention there. The reason that it has become such a problem in Russia is due to the fact that the precursor chemical needed, which is codeine, is very easily accessible over-the-counter. This chemical, along with phosphorus, iodine, paint thinner, and other dangerous additives, are “cooked” in a chemical reaction reminiscent of the same way that methamphetamine is clandestinely manufactured. The reason that this drug is so devastating to its users is due to a specific chemical reaction that happens to the iodine or other chemicals in the reaction. To put it simply, the way that clandestine desomorpine is manufactured results in an incomplete bond between certain molecules that allow for excess amounts of unneeded chemicals to be leftover in the reaction. Most would suggest a simple washing procedure for such a thing but in this instance that will not work. This is due to the fact that a wash simply removes excess chemicals left over in the reaction, not excess chemicals actually bonded to the final product. These toxins are what causes the flesh eating effects of Krokodil. How Could This Possibly Appeal To Anyone? It is truly amazing that anyone could get to the point of using such a dangerous, cannibalistic, and deadly drug. However, more often than not, a user simply does not begin with a substance like Krokodil, it is a long slippery slope eventually landing individual’s in the midst of madness that is addiction. As with any other drug, there are reasons that users typically move on to something insane like Krokodil. For most, opiate addiction starts out innocently enough. They may be prescribed medicines by a doctor for a serious injury or other truly painful condition. As the condition slowly gets better over time the individual may begin to realize that they liked the way their medicine made them feel. So despite their condition getting better they continue to seek out the pain medicine from their doctors. What started out as an actual need has now progressed into a habit. So what happens once this habit is established? The answer is very simple if the habit is not addressed and stopped immediately, this answer is addiction. Addiction is distinctly different from habituation in that when you are addicted you no longer enjoy the effects of the painkillers that you were taking. You simply continue to take the medicine to keep away the sickness that you know will come if you no longer have them. At this point, all positive effects are gone and replaced by the fear of what will happen when you run out. At this point, some people may actually decided to stop, realizing they have a problem they will seek out rehabilitation and become drug free. It is an undeniable fact, not everyone will take this course of action but will continue to not only abuse their medication but seek out stronger, cheaper alternatives that will at least make them feel good in their misery and failure. Painkillers can get rather expensive once an addict runs out of their own supply, ranging in prices from $20-$40 for a 40 mg pain killer such as Oxycontin, the price tag of addiction to opiates becomes rather steep rather quickly. Why spend so much money on a single pill that will get you high maybe one time? Especially when you can get multiple doses of heroin for about $45-$60, economically it doesn’t make any sense and this economic principle is further construed in the mind of the addict. Now moved up to heroin, the addict will follow the same pattern as before. Over the course of time, their tolerance to the drug will increase, requiring more and more of it to achieve the desired high that they are chasing. Along with this, the withdrawals from the opiate become more and more severe when they run out. The thing about opiate addiction is that it affects so much of your brain chemistry in the reward center that it is highly mentally addictive; it also affects your body physically creating a physical dependence that results in excruciating real physical pain when the drug is absent from your body. Opiate addiction creates a weakening of bone marrow and an ultra-sensitivity to the user and their pain threshold. Time goes on and even the heroin becomes too expensive for the addict to score. Sadly, the final stop for people at this point will be Krokodil. Cheaper than even heroin, about one-third of the price to be exact, this is the next step up to the user. What they do not realize is that it is a step down even deeper into the pit of addiction, making their rock bottom that much more of an ugly place. When a user gets to the point of choosing Krokodil as their preferred and economically friendly choice they have become so afraid of what they experience without the drug that they are willing to even have their flesh slowly eaten away. With an average life expectancy of 2-3 years after addiction starts, it makes no sense to most people as to how individual’s could push themselves to such destructive ends. Can’t they just stop? Though much more complex than a yes or no answer, the simple answer is no, the user is so addicted to Krokodil that either hitting their bottom or death is the only answer. For some, if not most with this particular substance, their rock bottom and death are one and the same. As Krokodil gains more and more traction within the United States it will quickly become clear that current policy against drugs is a failure. If the War On Drugs was a success, then the USFG, DEA, and other branches of government would have figured out a way to stop or prevent krokodil from ever landing on US soil. In due time, it will become blatantly obvious to those in charge that maybe a smart on drugs approach would have served their purpose instead of their war. Until the time when those officials come around, more deadly and more dangerous drugs like Krokodil will continue to enslave thousands with its zombie like spell.